Judge Sise gives the oath of office to Matt Ossenfort with Melissa Ossenfort holding the Bible. Photo by Wendy Kissinger. 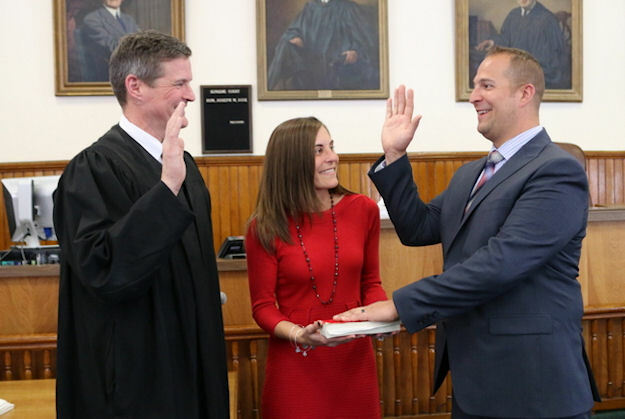 FONDA – Matthew Ossenfort was sworn in Wednesday as Montgomery County executive, completing the county’s transition to a new form of government. County residents voted in November 2012 to adopt a new county charter that changes the form of government from a 15-member board of supervisors to a nine-member county legislature with an elected county executive. This past November, Ossenfort defeated St. Johnsville Supervisor Dominick Stagliano to win a four-year term as the county’s first elected executive. Under the new charter, he is limited to a maximum of three terms. Congressman Chris Gibson, a retired U.S. Army colonel, praised Ossenfort’s leadership ability in his opening remarks. Sise also made a humorous reference to Ossenfort’s confidence. “He scheduled his honeymoon right after the election,” Sise said. Ossenfort’s bride, Melissa, was at his side during the ceremony. His formula for success is straightforward. Ossenfort said he already has met with several department heads in preparation for his new responsibilities.